Note that if you book on a Ski Kaos bus trip you won't need to worry about much of this as we will take care of everything for you. If you have never been to the snow before we strongly advise you to go on a bus trip. Please click here to see why a bus trip can be far better than driving. In NSW there are 2 major ski resorts: Thredbo and Perisher-Blue(Perisher for short), both are near the NSW town of Jindabyne, 463km south-west of Sydney. Thredbo is 35km from Jindabyne along the "Alpine Way". Perisher is 33km from Jindabyne along "Kosciuszko Rd". Perisher-Blue comprises 4 areas: Perisher, Smiggins Holes, Blue Cow and Guthega. You can park in Thredbo for free indefinitely, but if you drive to Perisher you can only park from 7am-7pm. You cannot leave your car in Perisher or Smiggins overnight. An alternative way to get to Perisher is to drive 20km from Jindabyne along the Alpine Way (ie: along the road to Thredbo) and park at 'Bullocks Flats'. The Skitube Alpine Railway starts here. Skitube is a train that goes through a tunnel bored through the mountain. 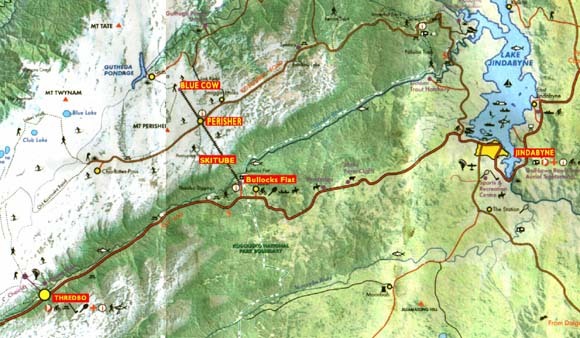 Skitube starts at Bullocks Flats and has a train station at Perisher and another one at Blue-Cow. The train takes 20mins from Bullocks to Perisher and another 10mins to Blue-Cow. All of Perisher's lift passes include the use of the skitube train between Perisher and Blue Cow, but it costs a heap extra to use the resort-access section between Bullocks Flats and Perisher. Lift passes are often referred to as "including skitube" (or "train") or "not including skitube". However this only refers to the Bullocks to Perisher section of the train line since the Perisher to Blue Cow part is always included. With a Ski Kaos bus trip we always include the NPWS entry fees. If you drive to drive to Thredbo or Perisher you have to pay this outrageous NSW Government tax yourself to enter the National Park. It is $27 per-car per 24-hour period (or part-thereof), or $190 for an car's annual pass. You pay at the entry gate on the road. Inspectors are rampant and there is a 99% change you will get fined $300 if you do not have valid a permit on your car. If you get the skitube from Bullocks to Perisher then the NPWS fees are included in the ticket, but the overall extra cost for skitube is far greater than the entry fee. If you take a 2WD car to the snowfields you will need to carry snow chains. You can rent snow chains, so ask us about rentals. There is a choice of staying in the actual ski resort, or staying in Jindabyne town and travelling to & from the snow each day (35km each-way). Staying in the resort is usually referred to as "on-snow" accommodation. Usually this is a lot more expensive than Jindabyne, but Ski Kaos only charges a little bit extra for this. Largely because of prices, about 65% of snow-holiday makers in NSW choose to stay in Jindabyne, located ~35km (45mins) from the ski resorts, but if you can afford the extra to stay in Thredbo, it is a far nicer village & well worth the extra cost; - with Ski Kaos this is not such a lot. Likewise it is much better to stay in Perisher than in Jindabyne, but far more expensive. Staying in Perisher costs a small fortune simply because there are relatively few places to stay there, so the laws of supply & demand push prices into the stratosphere. Thredbo has a lot more beds in its village, so prices are not as high, but still pricey, except with Ski Kaos where its not a lot more than staying in Jindabyne. Generally speaking Thredbo accommodation alone is about double the price of Jindabyne, Perisher about triple. This is a very general rule however. From late June to early September, almost all Thredbo & Perisher accommodations will only accept bookings as follows: 2 or 7 nights arriving on a Friday, or, 5 or 7 nights arriving on a Sunday. The reason for this is that snow accommodations get little business outside of winter, so they heavily rely on 100% occupancy during this period. Most people like to book 2 night weekends and 5 night "midweeks". So, for example, if an accommodation accepts a 3 night weekend booking, then they are left with 4 nights that are very difficult to sell. Jindabyne accommodations are more flexible. Whether you book one of our bus trips or an independent holiday, Ski Kaos are wholesalers for Thredbo so our prices are very good for Thredbo accommodation, Thredbo lift passes, and Thredbo lift+lesson passes. Although we offer competitive deals at other resorts, most of our customers chose Thredbo because our Thredbo prices are so good. In addition our buses travel to Thredbo, so if you want to get to Perisher you need to catch the skitube from Bullocks Flats (12km before Thredbo). This makes Perisher even more expensive as skitube is a costly add-on to Perisher's lift passes. Fly + Bus To The Snow? (note that we have a trip or two each year that runs ex-Brisbane and picks up along the coast as it heads south). Most flyers are best off flying to/from Sydney and joining a Ski Kaos trip in Sydney. You can fly to Canberra but the flight times do not mesh well with Ski Kaos' bus timetable. Additionally flights to/from Canberra are usually far higher than to/from Sydney. Check the flight prices for all airlines: Jetstar, Virgin-Blue, Tiger Airways, Qantas and Rex for regional towns. If you are really keen on flying to/from Canberra, do take the time to check the same day's Sydney airfares as they may be far cheaper. Do not assume you must fly both ways on one airline - often its cheaper to fly one way with one airline & the return leg with another. Do not assume you must get on at your local airport - if you live in Southern Qld it's worth checking out flights to/from: Brisbane, The Gold Coast, Sunshine Coast, and even Ballina. One time we suggested a Brisbane client lookup Sunshine Coast flights - she saved $200 each way as all the Brissy flights were expensive. Be very careful to check your baggage allowances - especially if you plan to fly with skis or a snowboard, read the fine print very carefully before you pay for flights. If you plan to fly to join a Ski Kaos trip, make sure you call us first to reserve your spaces on the trip.